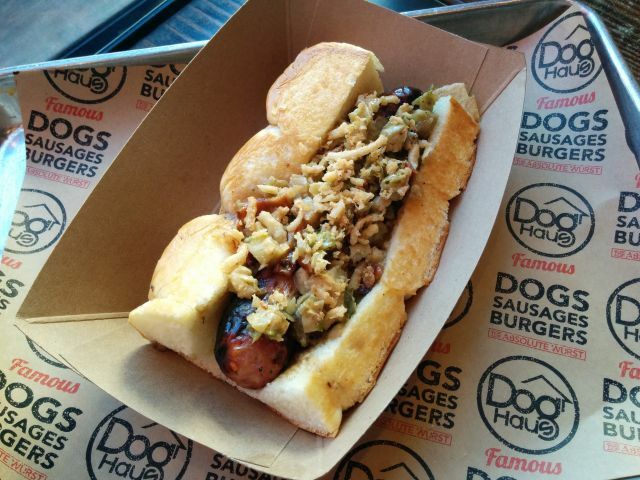 Dog Haus' Turducken Sausage features a smoked turducken sausage made with turkey, duck, chicken, cranberries and sweet potatoes topped with sage gravy, roasted Brussels sprouts and bacon slaw, and crispy fried onions on King’s Hawaiian rolls. I picked one up for $7.99. The sausage was flavorful and very juicy, but mixed all together I didn't really get a good sense of the many components. Then again, the whole idea of cooking three different birds together rather than separately always seemed unnecessary. Here, it's nice if you like the idea of turducken but not so much if you actually want to taste turkey, duck, and chicken (or cranberries and sweet potatoes for that matter). It's a very good sausage though. 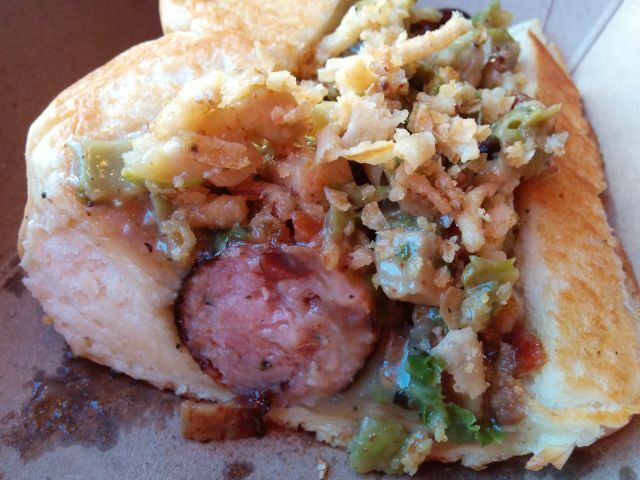 The sausage gravy offered a rich and herby combination and mixed in with the Brussels sprouts and bacon. There was a bit of a tang somewhere in there. I guess it was the slaw but it was all mixed in so I wasn't really sure. The onions provided a crunch and flavor that you might find on a casserole. 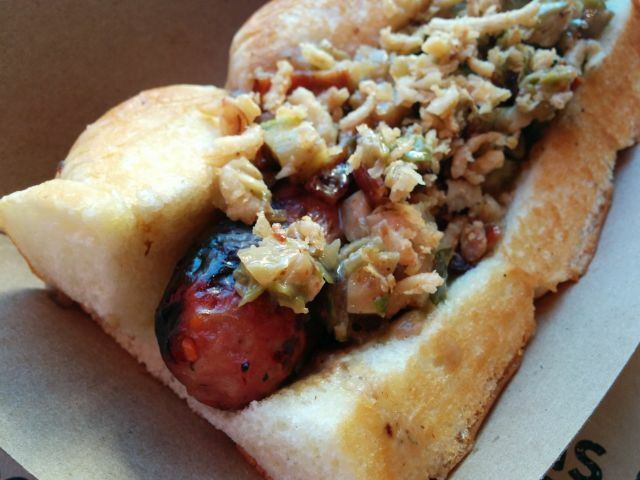 Overall, Dog Haus' Turducken Sausage is nice and tasty with a variety of tastes and textures that work but doesn't quite get me thinking "Thanksgiving." Maybe a stronger cranberry note or some stuffing or mashed potatoes might do the trick.